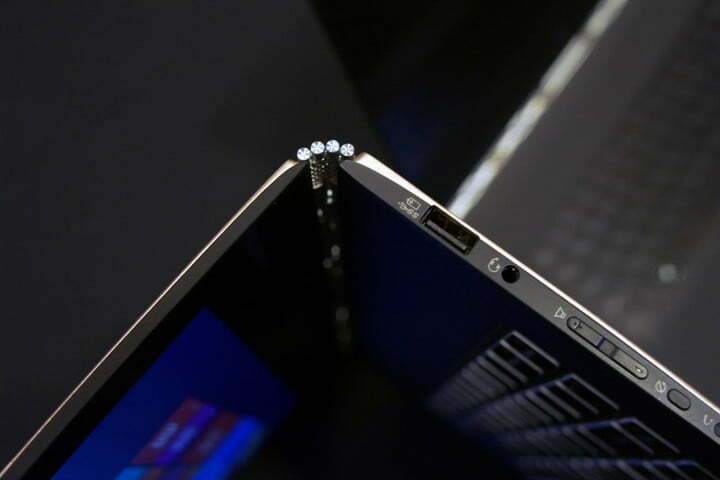 The Lenovo Yoga 3 Pro is light, innovative, and boasts some eye-catching aesthetics. However, its $1,349 price tag is steep. 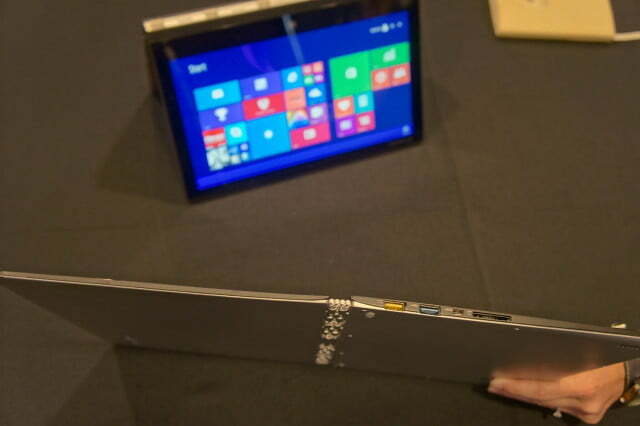 While the predominant design in convertible laptops these days seems to be settling on the fold-over, 360-degree hinge, it’s Lenovo’s Yoga that kicked off the craze of double-jointed computing devices. 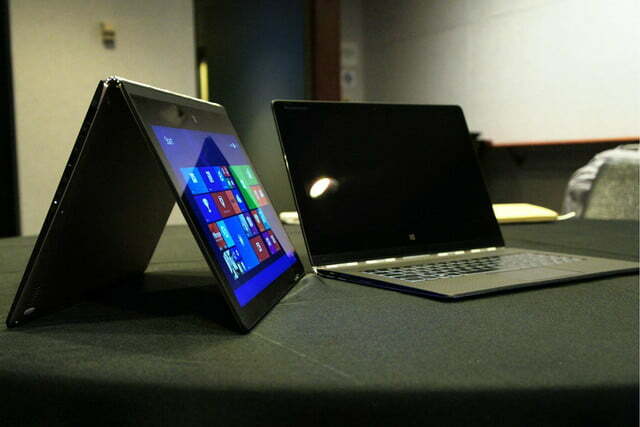 The company has since released the Yoga Pro, Yoga 2 Pro, as well as the ThinkPad Yoga. But with so much competition from other companies, like HP’s x360, Lenovo can’t afford to coast on its convertible achievements. It’s clear from the new Lenovo Yoga 3 Pro that the company is still pushing the design in new directions. We got some hands-on time with the Lenovo Yoga 3 Pro at a press event in New York, and came away quite impressed with it. The all-new, all-metal “Watchband” hinge is the Yoga 3 Pro’s most striking feature, but there are plenty of other novel attributes packed in the laptop’s thin frame as well. Lenovo says the Yoga 3 Pro will be a Best Buy exclusive, with a fixed configuration, and a rather hefty price of $1,349. Here’s what we think of it, and what you need to know. 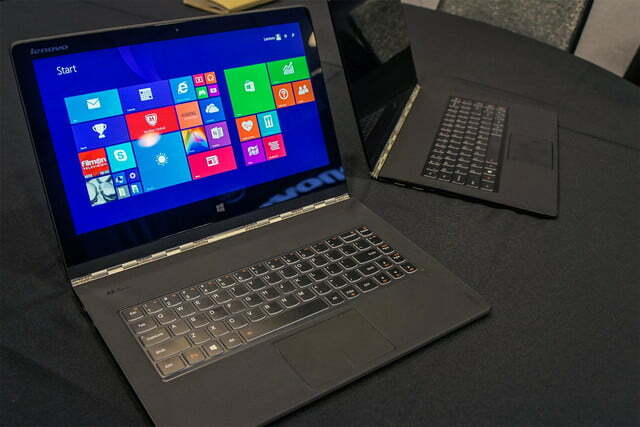 Running on a brand new, low-power Intel Core M (Broadwell) processor, the 13-inch Yoga Pro 3 is two millimeters thinner than the previous model, which puts it at 12.8mm. The company also says it weighs 2.62 pounds. There’s also no fan inside, so the laptop should run dead-silent at all times. 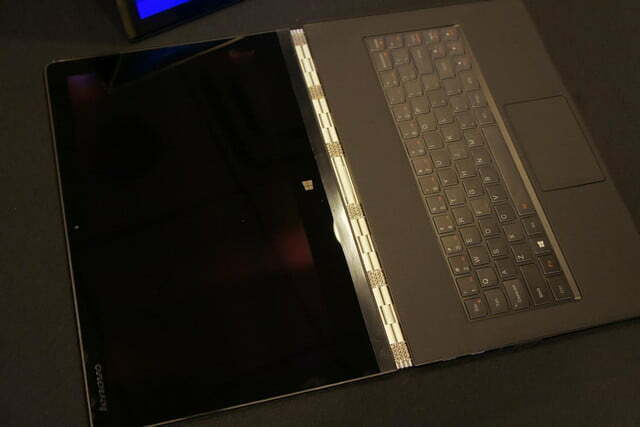 It’s clear from the new Lenovo Yoga 3 Pro that the company is still pushing the design in new directions. 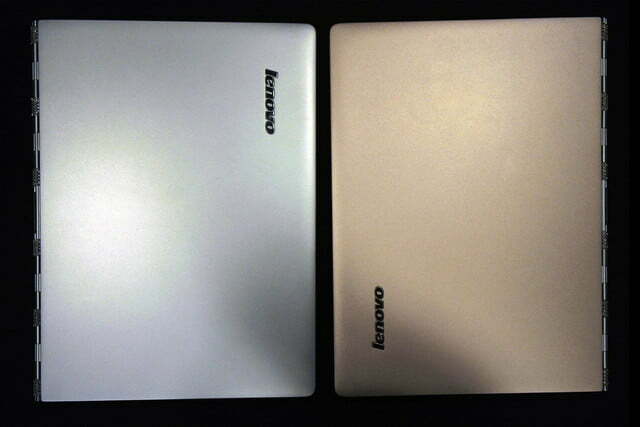 Silver and orange will be returning as color options, with Lenovo adding a “Champagne Gold” version this time around as well. Note that the metal hinge is silver on all models, so it will stand out more with some color schemes than others. It’s quite noticeable, even on the silver model. 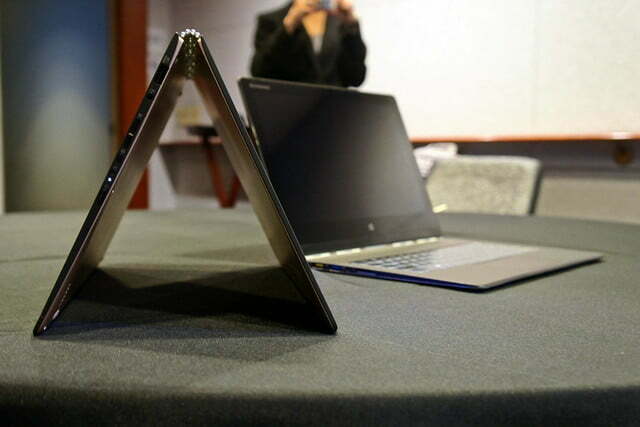 Lenovo says they’re launching the Yoga 3 Pro as a Best Buy exclusive. It packs an Intel Core M-70 processor, with a 256GB SSD, up to 8GB of RAM, and the same 3,200 × 1,800 resolution screen found in the Yoga 2 Pro. We’re still convinced that this many pixels is overkill for a laptop with a 13.3-inch screen, especially since you’ll get significantly shorter battery life. Besides, you won’t actually see the extra pixels that the Yoga 3 Pro has to push unless you’re holding its display a few inches from your face. This is an issue we talked about with last year’s model. However, what you lose with battery life due to the presence of the super high-resolution display is somewhat offset by the inclusion of Intel’s low-power Core M processor. The Core M CPU helps the Yoga 3 Pro achieve a claimed battery life rating of up to nine hours. Still, most users would be better off with a 1080p screen, which could allow the Yoga 3 Pro to achieve roughly 11 to 12 hours of endurance. Perhaps a 1080p model will be announced sometime in the future. That being said, the screen looks great. For what it’s worth, you may appreciate the extra pixels in tablet mode when reading magazines, or when editing large images, and video. The Yoga 3 Pro’s most distinctive new feature is its metallic hinge, which looks a fair bit like a watch band that’s stretched out to about 12 inches. While it definitely looks different, it works roughly the same way that the previous hinge does, allowing you to fold the screen back a full 360 degrees, or to any point in between. 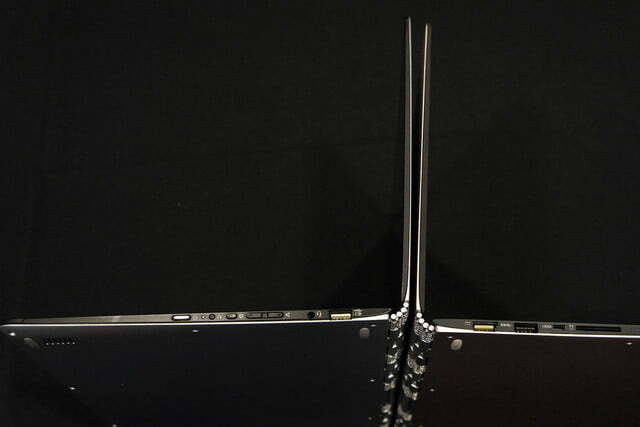 Rather than employing a pair of connection points, as most laptop hinges do, this hinge connects the screen to the base at four points. Hopefully, that means it’s more durable than other hinges, but only time (and public customer complaints) will tell. The hinge also gives off a different kind of aesthetic vibe than what we’re used to seeing from a laptop or convertible, probably because it looks more like high-class jewelry. Unfortunately, it doesn’t match the rest of the device. 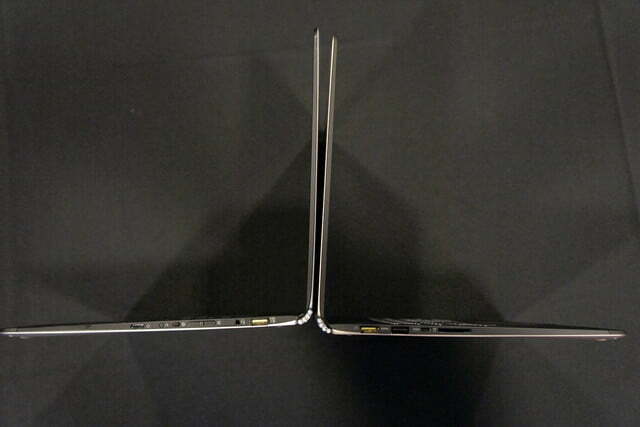 The Yoga 3 Pro’s lid and bottom are made from a softer-hued painted metal that looks nice enough, but doesn’t mesh well with the hinge (at least on the silver and gold models Lenovo showed off to us). The orange version may look better with the shiny silver hinge since its color scheme is loud to begin with. Still, we’d rather Lenovo either make the color of the hinge match the laptop’s lid, or make a silver model that’s just as shiny as the hinge. It’s always tough to stick lots of ports on a super-thin device, especially since you need to devote some room to essentials, like the power connector. However, Lenovo manages to pack in a healthy connectivity roster. 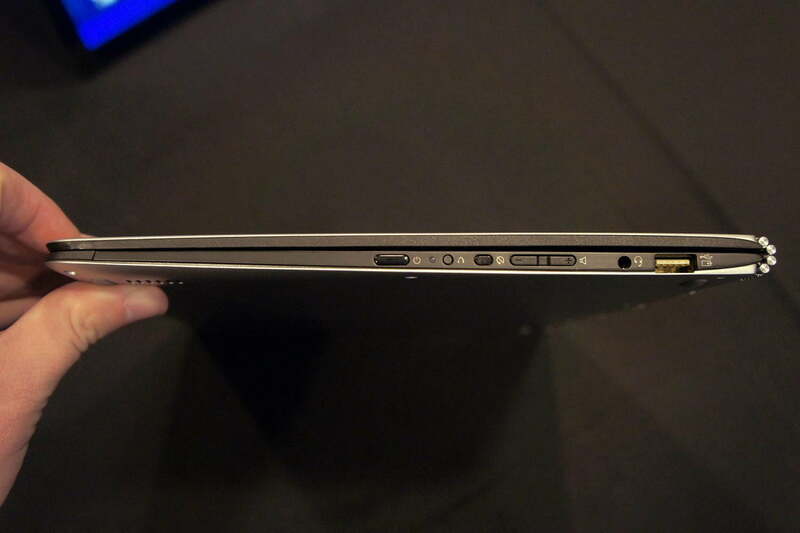 The Yoga 3 Pro features two USB 3.0 ports, a USB 2.0 port, an SD card reader, and a Micro HDMI port. There’s room for all of this because the laptop’s yellow USB 2.0 port (which is located on the left edge, near the back) also doubles as its power connector. Plus, the company has notched the connector, so you can’t accidentally plug it into the wrong port. The Yoga 3 Pro’s power brick is not much larger than the one you might use to charge your phone. Plus, the power cable’s connector is of the USB variety. So when you’re on the road and not charging your laptop, you can use the Yoga 3 Pro’s charger to juice up your smartphone or tablet. This is a nice feature, but it also means that it will be easier to lose (or simply forget to bring with you). While it looks a lot like a standard USB cable, it’s proprietary. 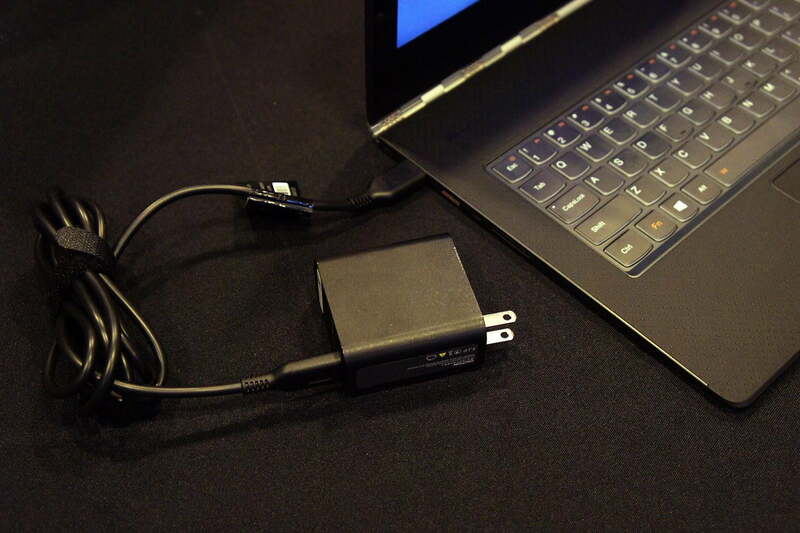 We would also like to see a second USB port on the charger, so you can charge your mobile device while also charging the Yoga 3 Pro. It doesn’t seem like Lenovo has changed much in the input devices department since it released the Yoga 2 Pro. 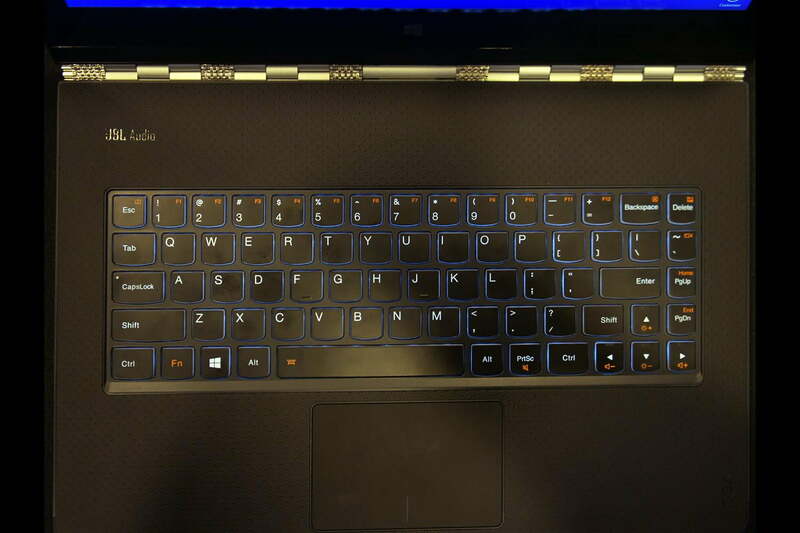 The Yoga 3 Pro’s keys are well spaced, have a decent amount of travel, and are backlit. The touchpad, while not overly large, feels solid, and worked well when we used it. With the Yoga 3 Pro, Lenovo is opting for a soft-touch, dimpled surface that does a decent job of resisting finger smudges. With the Yoga 3 Pro, Lenovo is opting for a soft-touch, dimpled surface that does a decent job of resisting finger smudges. We welcome that change. As you can see in our photos, there’s JBL Audio branding above the keyboard. Hopefully, this means Lenovo and JBL put some extra effort into the listening experience here. 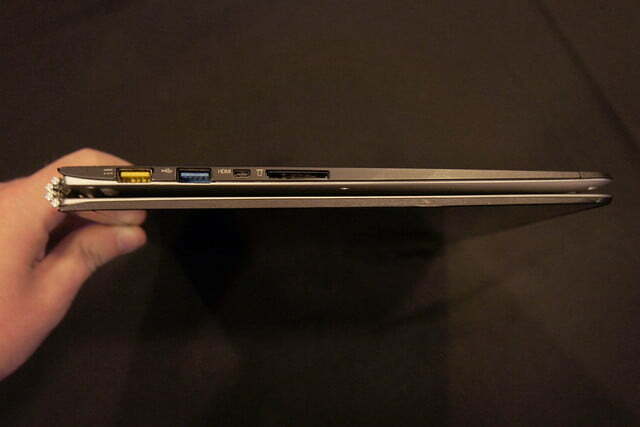 In a laptop this thin, we’re not holding out high hopes for a huge amount of volume or bass, but we’ll have to wait for a final review unit to make a solid judgment on the Yoga 3 Pro’s audio chops. A press room full of people isn’t a great place to judge sound quality. At $1,349, the Yoga 3 Pro is an expensive laptop, especially considering that you can buy simple systems like sub-$300 Chromebooks, and HP’s $200 Stream laptop. From a design standpoint though, the Yoga 3 Pro is the most innovative convertible laptop we’ve come across in a long time. Though we’re not entirely sold on the look of the Watchband hinge, it seems to work well, and will likely be more durable than the hinges found on previous versions. If you’re in the hunt for a light, high-end laptop that also doubles as a tablet, the Yoga 3 Pro could be one of the best options out there. Keep in mind that, when in tablet mode, the unit is still fairly heavy. Still, we’ll have to perform some actual benchmark tests, and spend some more time with the Lenovo Yoga 3 Pro before passing full judgment on it. For starters, we want to see how the Core M processor performs. The 5Y70 chip that’s in the Yoga 3 Pro is currently the highest-end version of Intel’s latest low-voltage CPUs. However, it’s still a dual-core processor with a base clock speed of just 1.1GHz. Hopefully, the Yoga 3 Pro can hit its top Turbo Boost speed of 2.6GHz when you tax the system heavily without throttling down due to the system’s fanless design. Then again, these chips were designed to live in fanless tablets and convertibles. So, if Intel knows what it’s doing (and it usually does), heat and performance problems shouldn’t be major issues with the Lenovo Yoga 3 Pro.